Jinny is never really happy unless she's with Shantih, her beautiful chestnut Arab mare. Together they roam the wild Scottish moors around Jinny's home, riding free with only the wind for company. 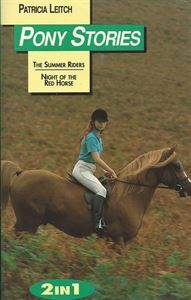 Marlene wrote: "This summer I am to ride an arab hors. Whyen I am on the hors we will go fast as flames." Not on Shantih, you won't thought Jinny. The mere idea of the brash, stubborn girl even sitting on her beautiful horse was out of the question.